Derry City striker, Rory Patterson is anxious to prove himself a hit at Brandywell again. EXPERIENCED striker, Rory Patterson, is keen to ditch his bad-boy image and prove himself as a role model as he relishes his ‘shock’ return to Derry City. And the 31 year-old Strabane man insists he still has what it takes to have a major impact in the League of Ireland having agreed on a one-year deal last week. Patterson, who netted an impressive 61 goals during 93 competitive matches for the ‘Candy Stripes,’ developed a controversial reputation during his two year stint at the Lone Moor Road venue. However, after a brief spell with Cockburn City in Australia and FC United of Manchester, he’s delighted to be back at Brandywell and is eager to prove himself once again as a top goalscorer and a role model to the club’s younger players. The striker, alongside goalkeeper, Gerard Doherty are the senior members of Kenny Shiels’ new-look team and he’s excited about a ‘new challenge’ at the club. “My demeanour on the pitch is fiery and it does come across wrong to some people, but I’ve never been one to take things personally and whatever happens on the pitch stays on the pitch,” said Patterson. “I was brought up old-school where I had old school pros having a go at me and that’s something I will have to adjust when playing with younger lads now,” he added. “Football is not that way any more. It’s more about putting your arm around players and encouraging them. “The average age of the team is around 22 or 23 years of age. When I was last at Derry, there were a few more experienced boys but there’s only Gerard there now. Patterson admits it came as a ‘shock’ when he got the call from Shiels about the possibility of a return to Foyleside and he claims it was too good an opportunity to turn down. “It came as a bit of a shock when I got the call fromKenny to come in and have a chat,” he explained. “Everything just seemed to fit with him being the manager he is and where he’s worked. It suited me, so it was too good an opportunity to turn down. “I feel fit enough,” he added. “My season in Australia finished in September so I was off from then until the start of November. “I came back and I’ve been training from then and by the time I get into pre-season I should be well up to speed. So I wouldn’t be too concerned about a lack of sharpness. I know some people will question that, but I don’t see it as a problem. “You’re always trying to prove yourself and will always have people who will say I’m too old or not fit or whatever, but I think I’m thick-skinned enough to deal with that. Derry City’s goalscoring problems were well documented last season with the club netting just 32 times in 33 league games and failing to score in 16 games. However, Patterson believes he’s the right man to help turn around the club’s striking difficulties. 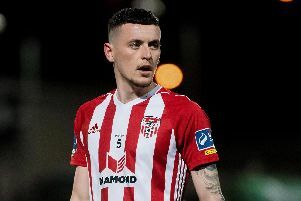 “I spoke to a few of my mates and a few members of my extended family who are Derry City fans and I was hearing that goalscoring was a problem last year. And Patterson explained the opportunity to work with new City boss, Shiels was one of the key reasons for his return to the club. “If you look through all the managers in the league there’s not many you would rather have than Kenny, with the CV he’s got. Meanwhile Derry City have re-signed Nathan Boyle ahead of the 2016 season. The striker has signed a one year deal for the Brandywell club.